Laser plastic welding is a process by which a laser is used to bond plastic materials. Widely used in the automotive industry, as well as medical and electronics sensor industries, laser polymer welding provides low thermal and mechanical loads to the component, is highly flexible, and doesn’t involve the use of particles or solvents. The laser transmits through the top material being bonded into the bottom material with laser light absorbing additives or fillers in the bottom material. Laser power, applied pressure between the two adjoining parts, and time are critical factors manufacturing components to have acceptable leaser welded joints. In some cases however, hot spots or cold spots on the joint may occur and affect the joint quality. Cold spots occur if not enough power is applied or the pressure applied between the two components is too great. Hot spots are caused by over separation between the top and bottom layers and can result in voids in the sealing area and in an unsealed assembly. This process can be controlled by temperature measurement of the weld and recorded with thermal map of the completed welded area. Using the Area of Interest (AOI's) feature in the ThemoView software allows you to see the temperature of the weld and compare to a reference point. Set multiple AOI’s on weld areas for continuous monitoring. 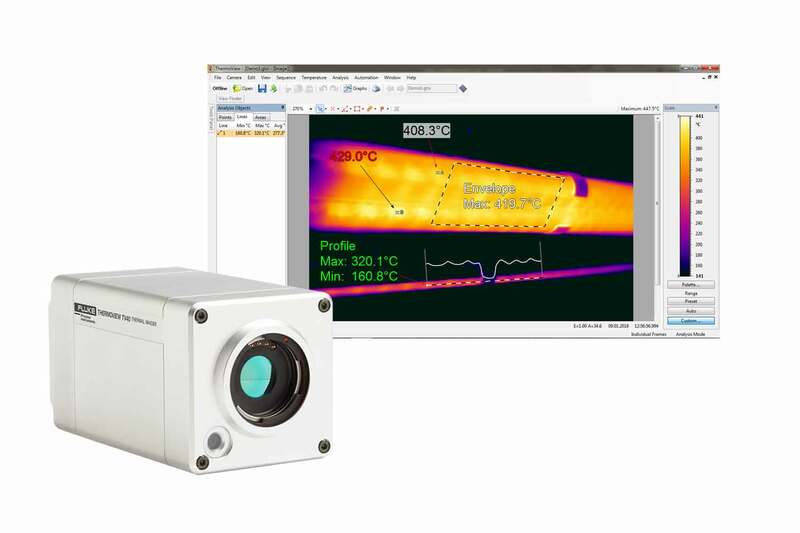 Using thermal map easily identify hot and cold spots on the joint that affects the product quality. Alarms relays are activated if set points are exceeded. Full integration of the software to the process system to set automatic alarming conditions. ThermoView software designed to interface with process control equipment, receiving synchronization inputs and providing pass/fail logic outputs allows to perform product inspections, temperature alarming and monitoring; and enable process temperature archiving.